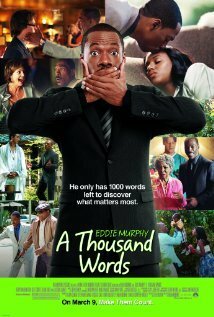 Eddie Murphy misfire has an interesting idea - namely a smooth talking agent tries to hustle a spiritual adviser who informs Murphy that he has as many words as there are leaves on the tree and when the last leaf falls he will die. With his life in the balance Murphy has to clean up his act before his time is done. Coulda woulda shoulda film is wrecked by Eddie Murphy's mugging and the desire to make this a comedy. Had this been played fairly straight this probably would have been a great little film. As it stands now its a great idea, with some great moments gets battered about by some really dumb comedy that undercuts everything. Its the sort of thing I watch in weird facination when it shows up on cable simply because its so wrongheaded at times. On the other hand I'd love to do a remake. Worth a look for those who like weird misfires.